Truck-mounted industrial air machines or vacuum loaders in the ERS fleet are all high capacity and designed to remove both dry and wet materials. 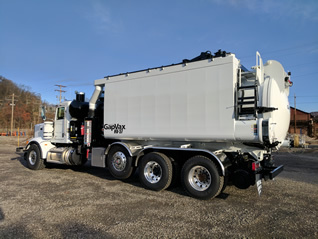 Featuring vehicles from VACALL™ and other manufacturers, our vacuum loaders include universal filter bags, twin-cyclone bulk material pre-filters and easy access to all ductwork for easy decontamination. Single control tailgates and large dump chutes evacuate materials quickly. These units flow up to 2,800 CFM @ 27” of vacuum. Debris bodies are 16-20 yds, with steep dump angles for easy cleanout. 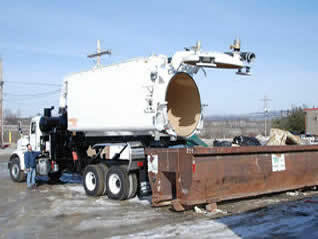 Offers a 17 cubic yard debris body made from 1/4″ EXTEN. Full opening tailgate with field-adjustable and dual cylinders.